NEW YORKWhile dieters are accustomed to exercises of will, a new English translation of Germany’s most popular diet book takes the concept to a new philosophical level. The Nietzschean diet, which commands its adherents to eat superhuman amounts of whatever they most fear, is developing a strong following in America. 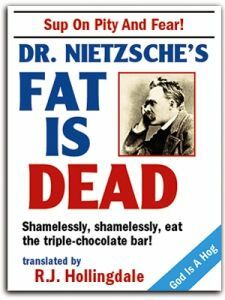 Fat Is Dead, proclaims the ambitious title of the dense, aphoristic nutrition plan, which was written by Friedrich Nietzsche in the late 1880s and unearthed three years ago. After reaching bestseller lists in Europe, the book was translated into English by R.J. Hollingdale and published by Avon last month. First formulated by Nietzsche, who felt lassitude and weltschmerz overcome him after a steady diet of Schopenhauer, the diet retains elements of that philosopher’s “The Fruit Bowl As Will And Representation,” but adds a persuasive personal challenge. Fat Is Dead is selling briskly, as are the accompanying recipe pamphlets Beyond Food And Evil; Human, All Too Fat A Human; and Swiss Steak Zarathustra. Dieters report that they are reveling in the powerful Nietzschean weight-loss message of self-realization, transcendence, and the personal freedom to eat certain foods which are not allowed on the Atkins and South Beach diets. Many Nietzschean dieters are reporting success, although some complain of side effects. 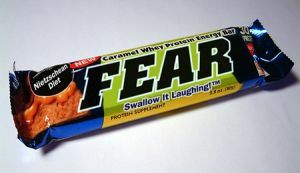 Above: A new product inspired by the Nietzchean diet. Kansas City’s John Mencken started the diet in January. He lost 35 pounds, eight inches from his waistline, and many of his slave moralities. He also lost the love of his life, Marissa Hapsgood, who walked out on Mencken after discovering his involvement in a romantic triangle with a poet and a sculptress. The Nietzschean diet has its critics. Detractors say the diet’s actual nutritional requirements are vague, that it provides no concrete plan for progression toward weight-loss targets, and that the book consists mostly of unclear and unusually harsh sets of inspirational logical lacunae. Stearns said it was worth noting that Nietzsche died depressed, delirious, and overweight in Zurich after 10 years of near-catatonia.